There’s got to be more to an inviting pool! Your pool area is also the best outdoor living space to relax, read a book, catch up with your family, and watch your kids play. And there’s no better way to enjoy this part of your home than investing in pool chairs that offer the most comfortable and luxurious seating area. You pool chairs can be either be simple or a stand-out. But most importantly, it should want to make your stay in your pool area and enjoy the space for hours. 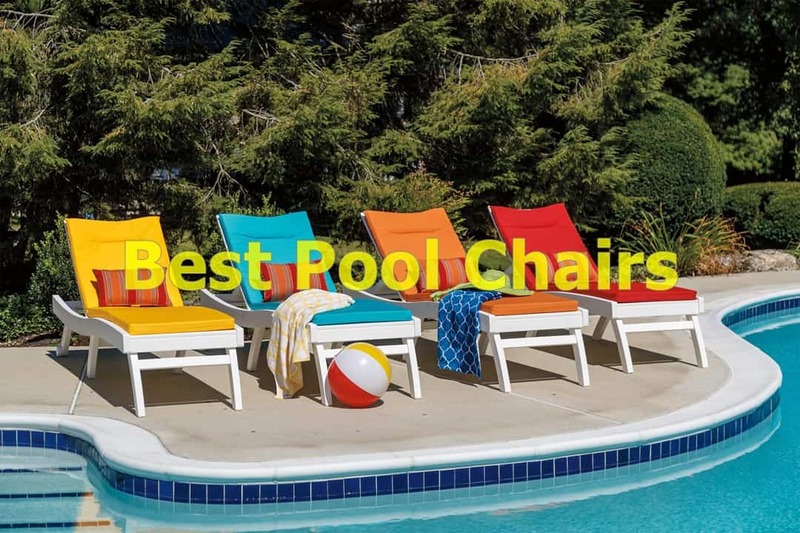 We have consolidated the best pool chairs according to their look, function, price and aesthetic appeal. This pool chair transforms from an upright chair to a recliner in seconds. It offers a zero-gravity experience when you lie down for the ultimate comfort and relaxation. It has contoured armrests and padded headrests. The durable frame with bungee support guarantees reliable support and can accommodate up to 300 pounds of weight. The Textilene fabric is an all-weather fabric – breathable and stays cool even under the sun for hours. The portability of this chair will let you enjoy it not only on your, but you can also take it with you by the beach or during campings. This chair is a gem simply because it is more affordable than similar-looking pool chairs. The ease of use and the warranty offer makes it a decent buy. 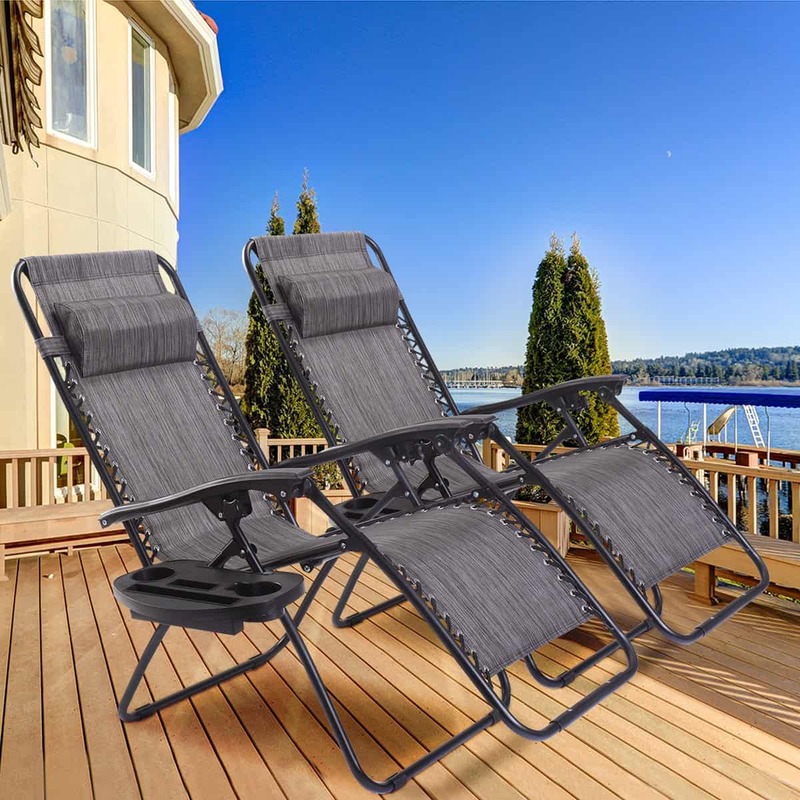 This pool chairs come as a set of two and does not require any complicated installation procedures are you can use it straight out of the box. The brand promises a “weightless” experience when lying down because of the combination of the Textilene fabric and elastic cords which allows the double bungee suspension system. 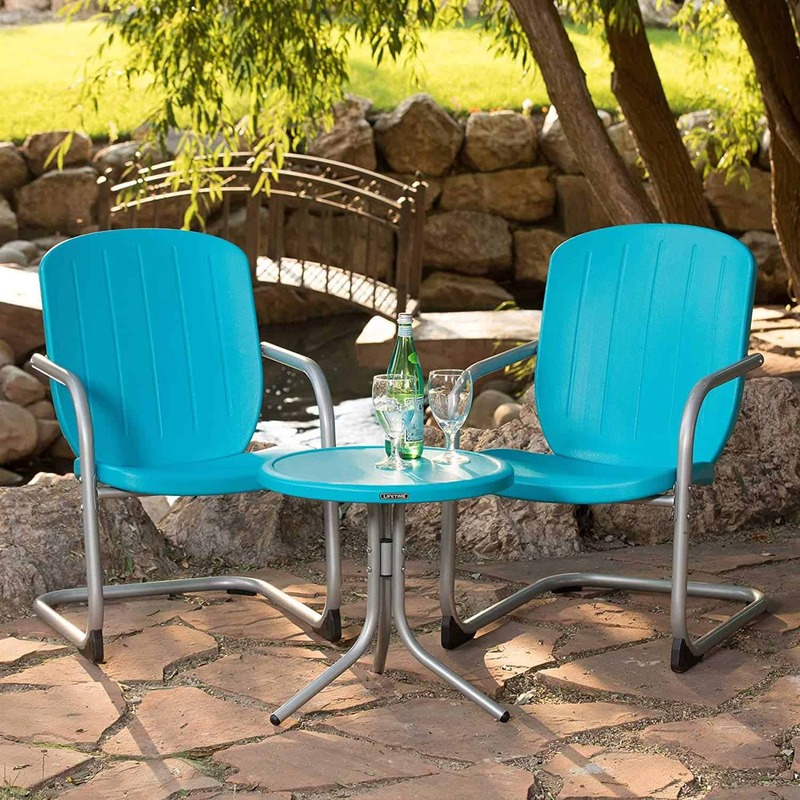 This set of two chairs are available in six (6) lovey colors – Aqua Blue, Black, Blue, Brown, Burgundy and Gray. It comes with a removable and adjustable back pillow and an accessory tray which has a room for two drinks, a phone holder and a slot for a book, table or magazine. It is also easy to store or carry with you on your beach or park trips. It supports up to 250 lbs. of weight. ​It feels flimsy and has a weight limit of 250 lbs. Buying this in a pair gives more value for money and the accessory tray as an add on is a delighter. The 6 color options will also make this one an excellent choice for pool owners. 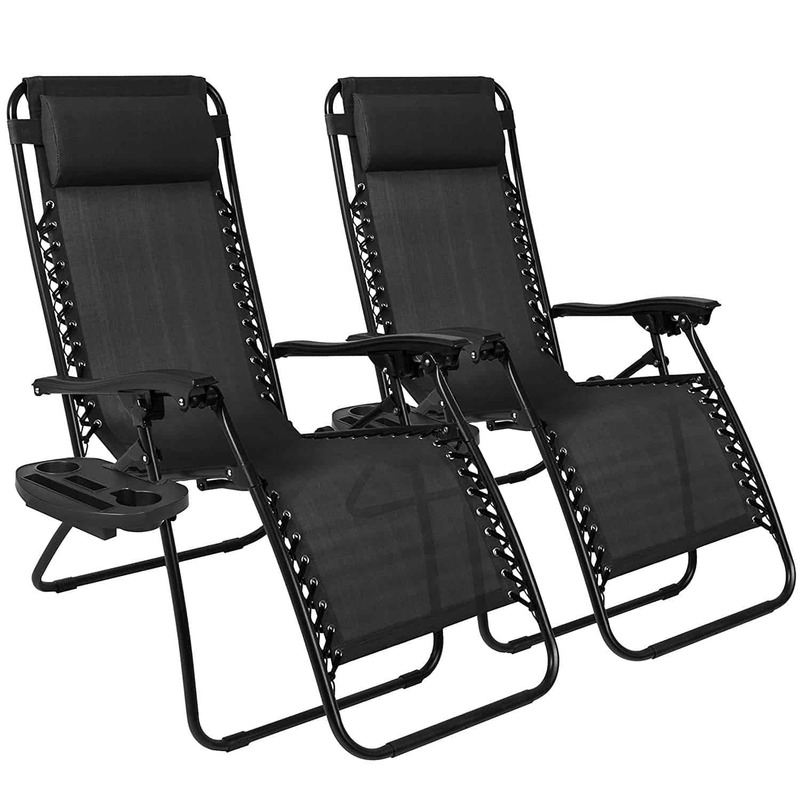 This set of 2 chairs can be best enjoyed as a straight up chair and as a recliner and it can go with you even on your beach trips. The frames are made up with aluminum seat posts and steel leg posts and it guarantees to support up to 300 lbs. The chairs use a knit design fabric for longevity even under the sun for long hours. It comes with a plastic tray which can hold two drinks, a magazine or tablet and your phone. The detachable headrest can also become lumbar support and is washable. This chair is available in 6 colors – Beige, Brown, Wine, Black, Light Blue and Light Gray. It may not be the cheapest set of 2 pool chair in its league, but remarkable reviews from its former users are worth checking out. 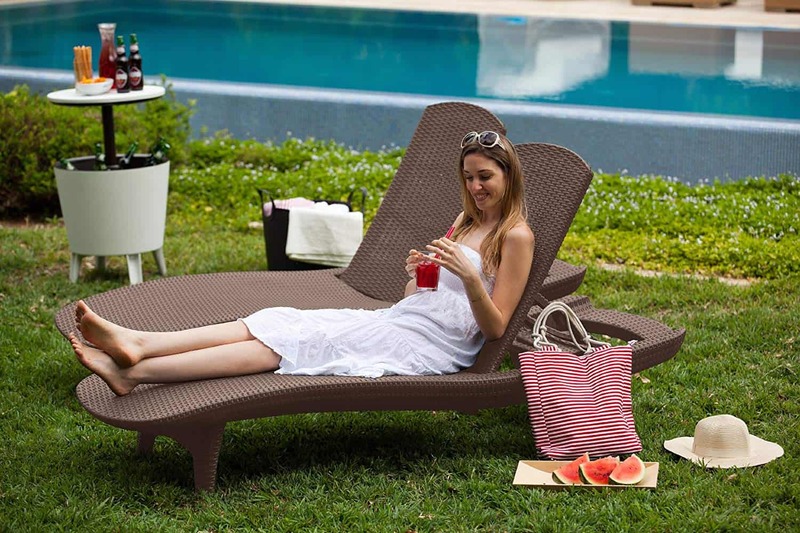 Take that hotel poolside experience into your home with this chaise lounge for your pool. It comes in a set of 2, 4 and 6. 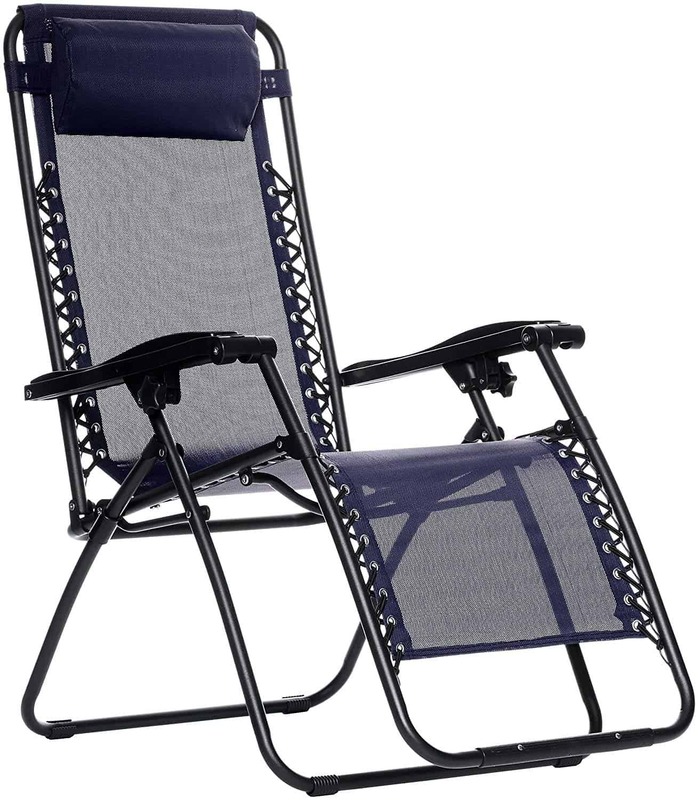 It is made with a durable powder-coated steel frame and a UV-resistant Textilene fabric for a worry-free relaxation. The wide and ergonomic design of its armrest makes it more comfortable to stay in it for hours. There are four (2) adjustable back positions and two (2) foot positions. The chair has a non-slip foot mat to secure it in place even when the pool deck is wet. It is easy to fold and store and it can support up to 300 lbs of weight. Style meets comfort in this pool chair and for those who are looking for a modern-looking option that offers a great deal of comfort, this is the best buy for you. Versatility, functionality and durability are the top promises of this pool chair brand. Versatility comes with its five (5) adjustable back positions and two (2) foot positions. It can be a simple chaise lounge or can easily be upgraded into a more luxurious recliner when you buy the cushion specifically made for this chair (sold separately). It is sturdy yet light to carry because of its aluminum frame. The Textilene fabric is also light, UV-resistant and easy to clean because it is oil-proof. This chair mimics the natural look and feel of rattan and will give a tropical feel to your pool. The resin wicker will feel cool on your skin even under extended periods under the sun. It is durable, weatherproof and easy to clean. You can use it right away upon delivery and does not need any assembly or setup. It is also foldable and stable in case you need to keep it during the winter season. It is also available with an add-on cushion in different colors to match the brown wicker chair. This pool chaise lounge is a bit on the high price point especially the one that comes with a cushion which will make it more comfortable. It is worth giving a try and accessories can be purchased later on. This all-weather pool chair offers the ultimate comfort and relaxation with its ergonomic design. It has an open weave rattan design using polypropylene resin and is contoured at the back and on the legs. It has four (4) back position adjustments and can easily be used and stored in minutes. It is available in four (4) colors – Brown, Whiskey Brown, Charcoal and Oasis White. It is easy to clean by using a water hose to remove dirt on the surface and to thoroughly clean it, a mixture of vinegar and water can be used. This pool chair meets the comfort requirement of any pool user. However, it would be better if additional comfort accessories like cushion can be offered considering the high price point of the chairs. Overall, the ergonomic and contoured design can compensate for it. 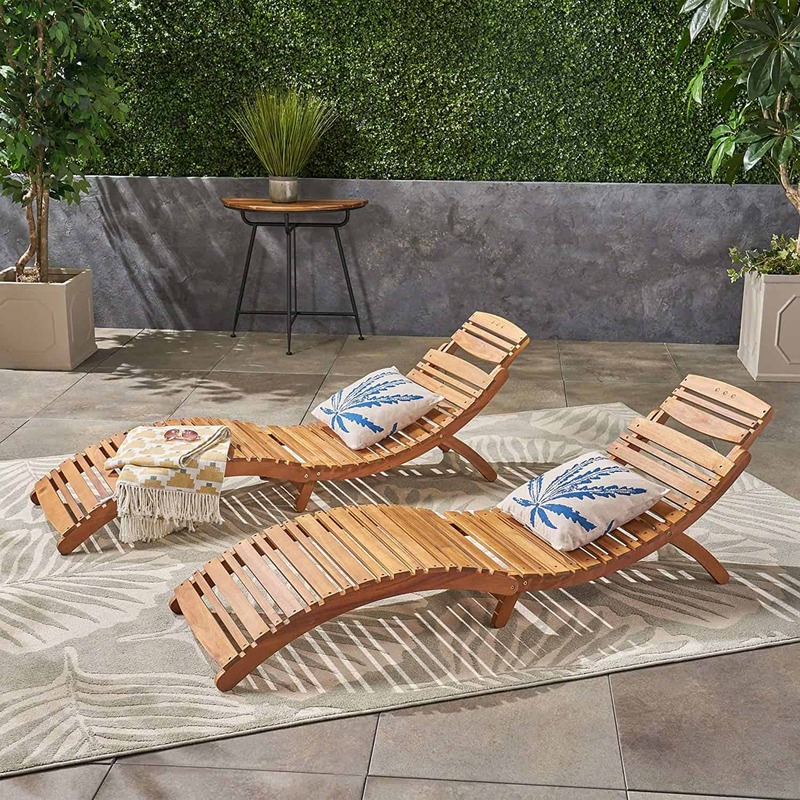 If you are looking for a statement piece for your pool, this wooden chaise lounge is perfect for you. Made with Acacia and Eucalyptus wood, this chair will add a more cozy and close to nature feel to your pool. It is narrower than most pool lounge chairs, but you can be assured of its durability and stability. It has impressive craftsmanship and is very stylish. It is easy to fold and carry with a built-in handle on the side. You can instantly add warmth and cozy feel in your pool area with this well-made pool chair. However, not everyone might be a fan of a pool chair which uses hard materials but adding some pillows and cushion might be of help. Like a La-Z-boy couch for your pool – that’s probably the best way to describe this cushioned all-weather recliner from Art to Real. 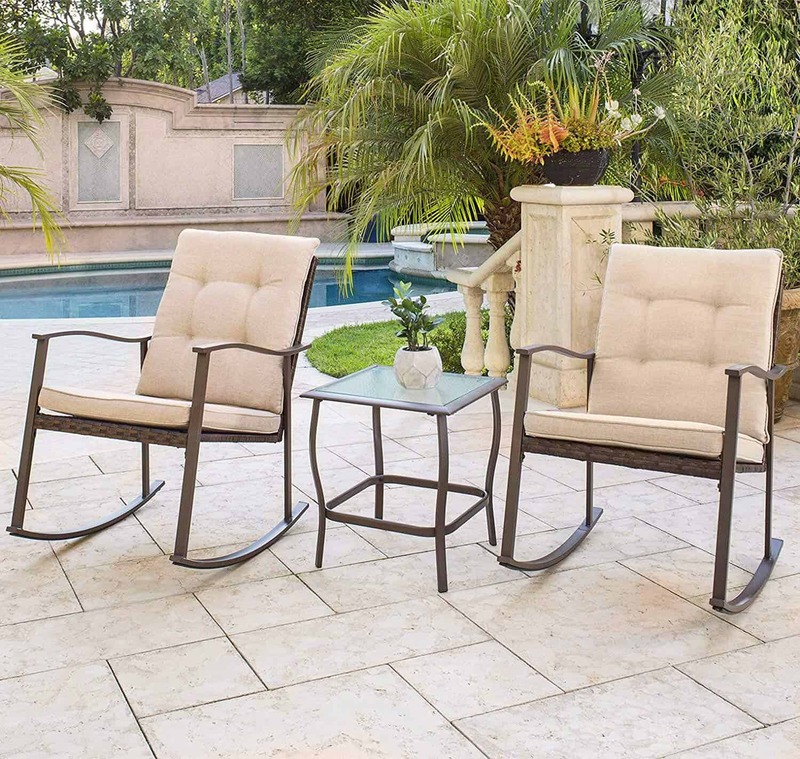 It is made with resin wicker and powder-coated aluminum frame for stability and durability. The back, seat and the leg rest are fully-covered with 5.12” thick cushion made from the combination of soft sponge and waterproof cushion cover. 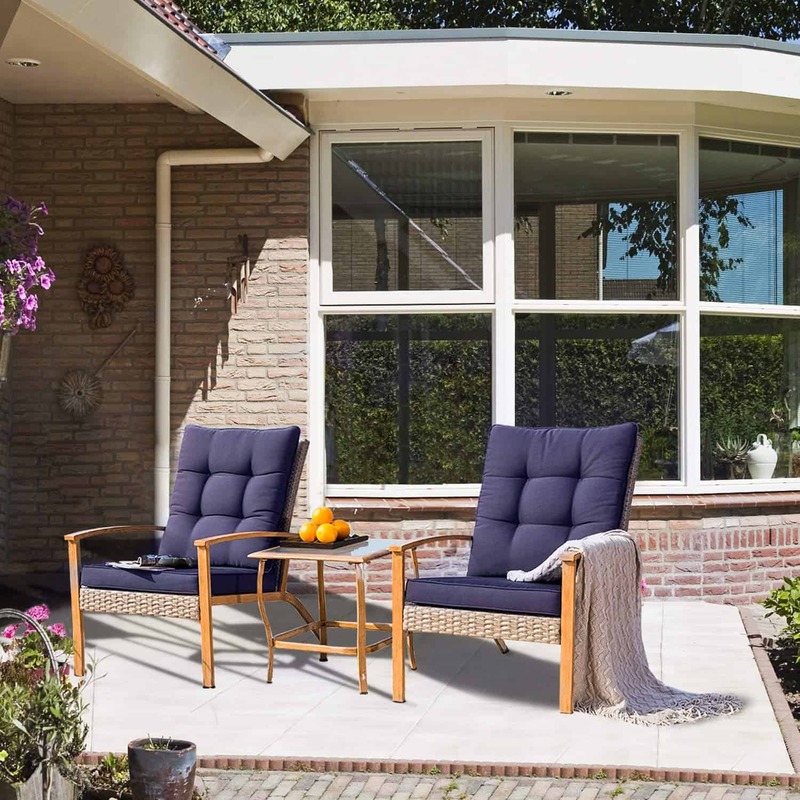 Both the cushion and resin wicker are UV resistant and waterproof. The hardware is also made from powder-coated aluminum to prevent rusting. It is easy to assemble with an instruction manual and all the accessories needed are included in the box. Although at a high price point, this pool chair offers comfort and durability that will last you for years. It is low maintenance and can be left under the sun, or it can even be rained on. It might be worth investing in. This simple yet stylish pool chair and table set is the perfect ensemble to add color to your pool area. Its modern built and design and its cool Turquoise Blue color make it an attractive piece. It is made with high-density polyethylene and powder-coated steel frame. The chair has a contoured design for comfort and you will never have to worry about chipping and rusting because it is weather-proof all over. The chairs and table are also covered by a 2-year limited warranty. This pool chair is a decent choice for a seating area on your pool. However, it lacks the functionality to be reclined, but you will definitely get what you pay for. ​This chair and table set is suitable for both indoor and outdoor use. The weaved resin wicker material is timeless, cozy and sophisticated. It has a high back seat with water-resistant cushion for the back and the seat itself. The frame of the chair and table are handpainted wood, but it is light enough to be carried around. The table has a glass top for a more elegant finish. 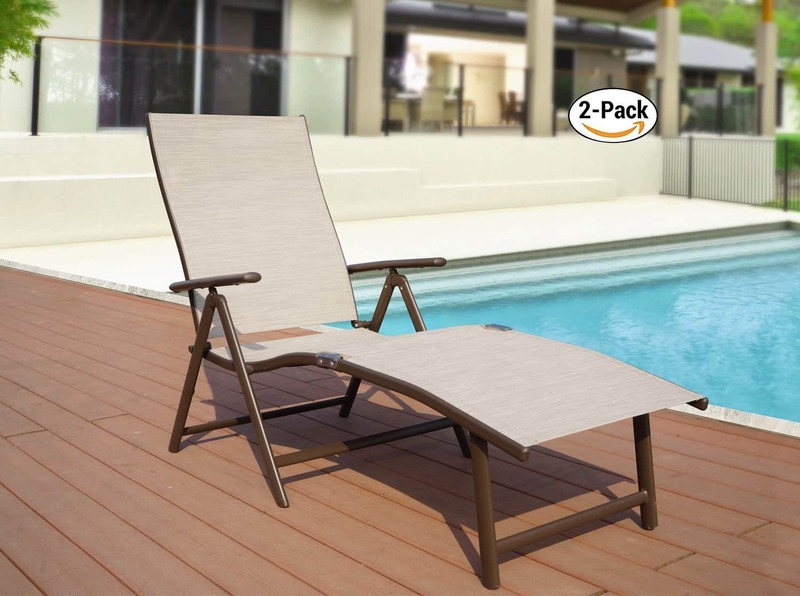 If you are looking for an inexpensive pool chair that comes with comfort, elegance and a matching table, this is highly recommended for you. The high back chair replaces the recliner feature and guarantees relaxation with its cushion. ​Take your outdoor relaxation to the next level by treating yourself and your family to this pool chair that rocks – literally. A little transformation for the earlier featured Solaura Outdoor chairs with table, this ensemble comes in 3-piece as well but with rocking chairs. This will surely appeal to a lot of users especially those who have family members who enjoy this kind of furniture. 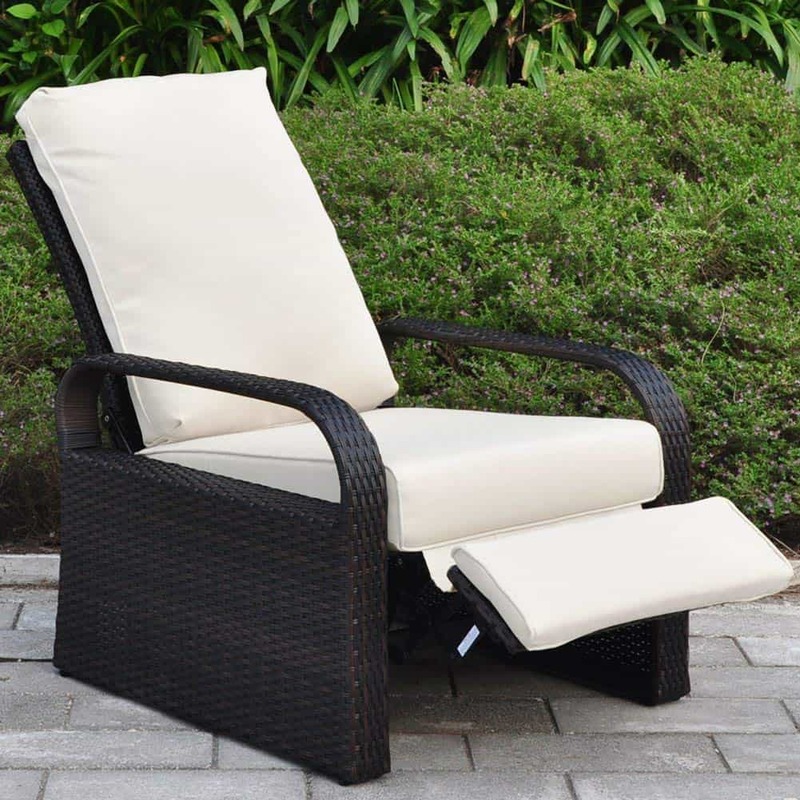 It is built with brown resin wicker, back and seat cushions covered in a premium Olefin fabric that is durable and weather-resistant. The rocking chair has an extended foot at the back to ensure the safety of the users. The table comes with a glass top and a wood grain finish frame. Rocking chairs are known to help you relax and aid digestion after meals. Having it on your pool area will be a great addition and gives you a piece of must-look-forward-to outdoor furniture. These materials are eco-friendly and sustainable. However, it may not last for a very long time unless it is appropriately treated and weatherproofed. Fading and changes in physical appearance must also be expected from these materials. These materials are weather-resistant and are easy to maintain. The downside is the quality of the materials may not be the same depending on the manufacturer and may still be prone to chipping and cracking due to prolonged exposure to heat. This material is used for the frames of pool chairs. It can be prone to rust and corrosion especially when placed around saltwater pools. It will need powder-coating and periodic painting to preserve the quality. This material can either be used as hardware or as the frame of the chair. It is lighter than steel and is rust-free. Choosing your outdoor furniture is the same as selecting the indoor ones. In needs harmony in style, theme and color. Choose a color that will complement the overall color palette of your pool. Brown and blue are the most common colors of pool chairs but accessories like cushion and headrests can liven up the colors a bit. In terms of style, weave rattan or resin wicker are versatile and will fit your tropical, modern or zen pool-theme. Most pool chairs will over adjustable back and foot positions, however, these chairs with flexible options may not suit your style. The pool chair features decrease, as the pool chair design gets more complicated. Find the functions you really need before you decide on the design. The functions require more thought than form. With all of the things above considered, the price factor comes last. Durability, materials and functionality will all contribute to the price of the pool chair. A $200 chair that will last you a decade gives more value than a $50 that will only last for 2 years. Your pool seating area will surely make you stay longer and enjoy your outdoor living space. Buying this outdoor furniture will need a handful of references to be carefully decided upon. We have listed a dozen of the best options in the market today, some are straightforward, some are stylish and some are suitable not just for your poolside but inside your home too. We hope that this guide will help you find the perfect pool chair that will make you sit back, relax and enjoy your pool even more.